On Saturday, April 28, 2018 – 10AM to 2PM local time, communities will team up with law enforcement to host the next National Prescription Drug Take-Back Day. You can call the Drug Enforcement Agency’s (DEA’s) Registration Call Center at 1-800-882-9539 or check the DEA’s website for collection sites in your area. The website will be continuously updated with new take-back locations. Consumers may also continue to utilize the guidelines How to Dispose of Unused Medicines as posted by the FDA if they are not able to attend a scheduled Take-Back Day. DEA began hosting National Prescription Drug Take-Back events in 2010. 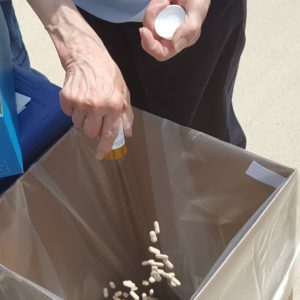 At the previous 14 Take-Back Day events, millions of pounds of unwanted, unneeded or expired medications were surrendered for safe and proper disposal. At the last Take-Back Day in October 2017 over 5,300 sites spread across the nation collected unwanted medications totaling over 900,000 pounds (456 tons). The disposal service is free and anonymous for consumers, with no questions asked. Keep in mind that needles, sharps, asthma inhalers, mercury thermometers, iodine-containing medications, and illicit drugs (including marijuana which is still a schedule 1 drug under federal law) are not accepted at the drop box. Opioid abuse is at epidemic levels in the U.S., and a top public health concern. The DEA’s “Take-Back” initiative is one of several strategies to reduce prescription drug abuse and diversion in the nation. Additional strategies include education of health care providers, patients, parents and youth; establishing prescription drug monitoring programs in all 50 states; and increased enforcement to address illicit methods of prescription drug diversion. In 2018, the U.S. government allotted $4.6 billion in the federal budget towards the expanding opioid crisis. The DEA’s Take Back Day events provide an opportunity for Americans to prevent drug addiction and overdose deaths. To find a collection site near you, please click here. RMV Changes to the MA State Markings Regulation 540 CMR 2:22 Cloudy With a Chance of… Flooding!